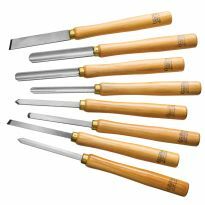 Comfortable rubber handles provide excellent control and reduce fatigue—replaceable carbide tips require no sharpening. Shave costs with this 3-Piece Carbide Turning Tool Set. 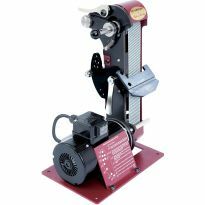 Each tool features a replaceable, rotatable cutter that eliminates the hassle and downtime of sharpening. Simply rotate the carbide cutter for a fresh, sharp edge, and replace it once all available edges have grown dull. The solid carbide cutting edges stay sharper, longer when compared to steel. The handles are turned from fine, solid ash, and are ergonomic with molded rubber that enhances your grip and reduces fatigue. I'm an avid amateur woodworker mostly creating small projects focused on scroll saw work. Although prior to now I have never once worked with a lathe I've long been curious about turning so I picked up an inexpensive lathe and began educating myself. 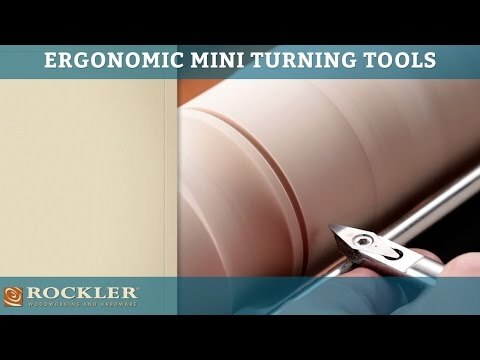 I quickly decided that the learning curve and frequent sharpening required by traditional gouges made them undesirable for me and elected to purchase this set of carbide tools from Rockler. The photo included shows one half of the results of my very first project - two hot air balloon mobiles made for our brand new granddaughter and very first great grandson. I am more than delighted. The tools work beautifully and feel great. If I were to change anything at all about these tools it would be to make the overall length about an inch shorter. The reason for this is that I discovered that on the lathe I purchased, the tool length makes it difficult to work directly perpendicular to cut down an end piece for re-use on another project as the far end, adjusted all the way out, gets in the way a bit. It can be done, but if the tools were just an inch shorter it would be easier. I want to stress that this is a very minor thing and does not detract whatsoever from my opinion of these tools. I would absolutely purchase these tools again and recommend them without hesitation or reservation! 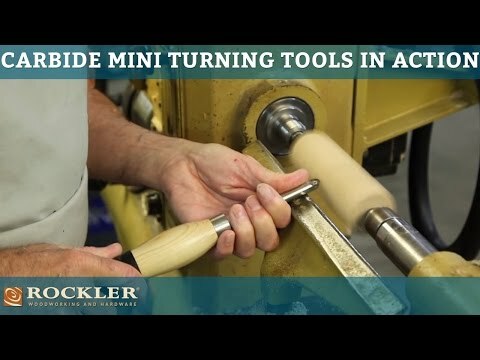 I have pondered a long time whether to purchase these mini tools or not.So glad that I did.The tools are so sharp and am able to do the little intricate cuts needed.I highly recommend anyone thinking about purchasing a set don't delay.The price is right and you will be glad that you made the choice to add to your lathe tools. Easy to tighten/change carbides. Comfortable. Consistent. Love the rubber handles. I can do more precision cuts than I do with my Easy Wood full size even considering I can "choke up" on them.Carbide is very sharp and cut hard maple well. I only wish radius square and negative rake cutters were made for it. I have been using these for about a month now and they work very well. I find the handles are very comfortable and easy to maneuver. Whether it be wood or acrylic they cut very well. 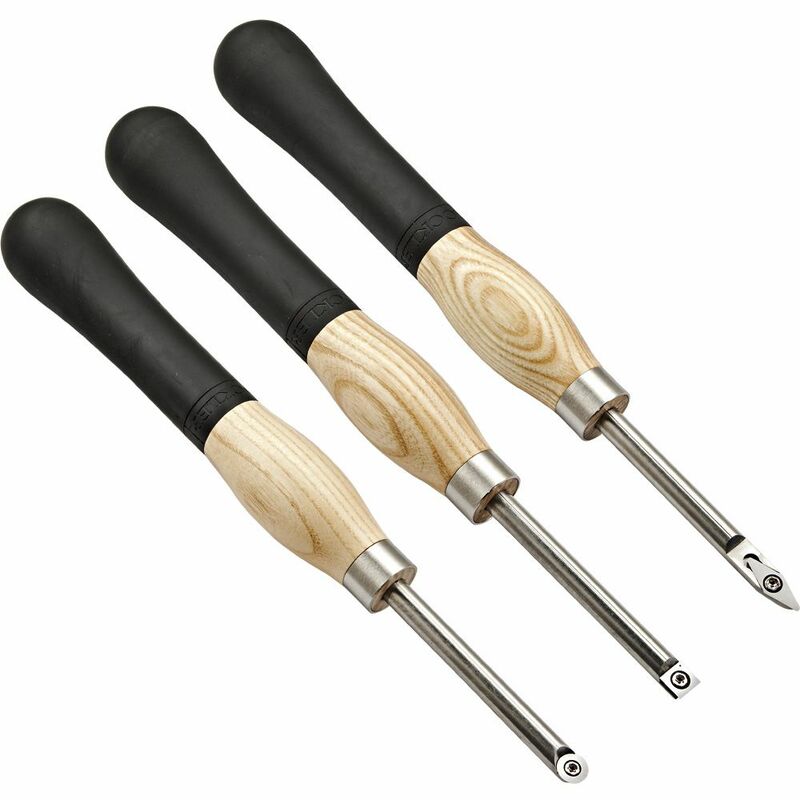 I would recommend these especially if you have a mini or midi lathe. These Carbide turning tool are worth every penny and I just can't believe I've done what I have without them . 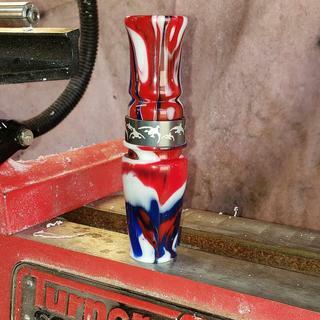 I turn custom duck call out of acrylic and these cut them like butter. 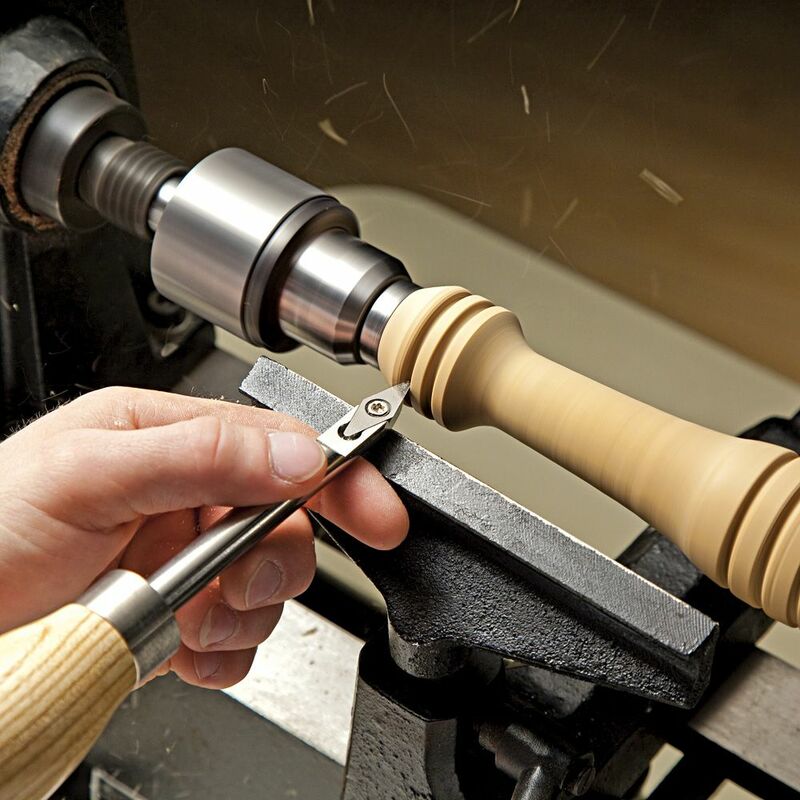 I had never turned anything on a lathe before. I bought this set. I really like them. I like the fact I don’t have to sharpen them. These were perfect for my teenage daughter, who uses them to turn our custom pen blanks. Absolutely love these! They are the perfect size for my needs, small enough to turn pens, tops, stoppers, and other kits, but big enough for bowls, vases, and spindles. The carbide is razor sharp right out of the box and lasts a long time. So far these seem to be a very good product,owned them about a month now and made several projects,still very sharp and very easy on the hands. Nice tool kit for beginners super sharp makes nice cuts. I bought these on sale and at that price they have to be the greatest value of anything I've bought from Rockler. "Feel" is a subjective thing, but these have fantastic feel. Sized as "mini" at 14" long, they're in a unique spot between pen-sized and mid-sized tools, so they really serve a purpose for me. And because they're so solid and have the big, tactile, rubber handle, I really look forward to using them when the size is what I need. I'd also say that if you're a beginner looking for a carbide starter set and these aren't too small, you really can't beat getting these on sale (<$130). I’ve just completed my first turning of a bowl using the ergonomic carbide tools. They worked great like other turners stated they would. Comfortable rubber handle makes it easy to grip. The chips just seemed to fly off as I moved across the wood. Would definitely recommend them to anyone wanting to try carbide tools. These tools are amazing. What a difference from regular steel turning tools. Awesome set of tools. 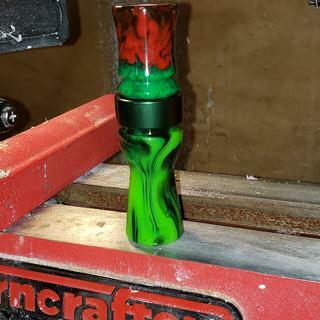 Makes turning fun. A great set to learn and experiment with. Will move on to more traditional tools as I gain experience, but will always use these. 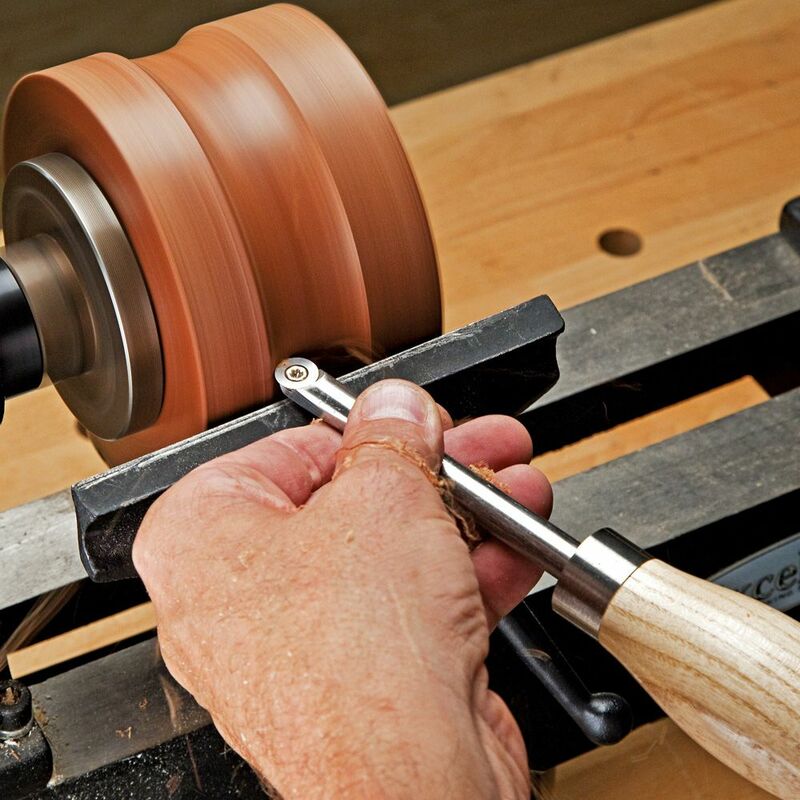 Handles are comfortable and using carbide cutters makes turning much easier. Do wish the handle and cutter shafts we're a little longer. I’m very happy with this set of turning tools. I would recommend them. These tools are TERRIFIC!! Very sharp, comfortable, and well-balanced. 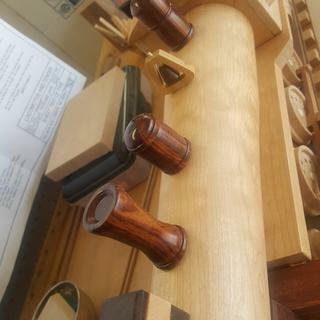 This is a recent purchase for a family member to use on their midi-lathe. I have watched them use the tools and have tried them myself. Excellent feel and result. Can not verify long-term reliability but completely happy with the purchase at this time. handels are extremely comfortable, carbide stays sharp forever it seems. Great tools for small bowls and pens. Took me a little practice to get used to the shorter handles but, I love the finished products! Great set of tools. Purchased for my son-in-law. 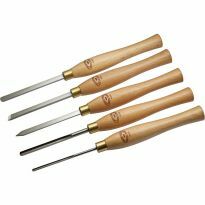 Great set of turning chisels! These are some of the best tools in my garage /shop. I would recommend these to any professional tradesmen, or diy'er. Really nice tools. Not much else I can say. Perfect for all the small projects I do on my mini 8"×12" lathe. First time using Carbide Turning Tools, but like the idea of not sharping them, lots more time turning. I bought them on sale and am very satisfied with their quality and performance. 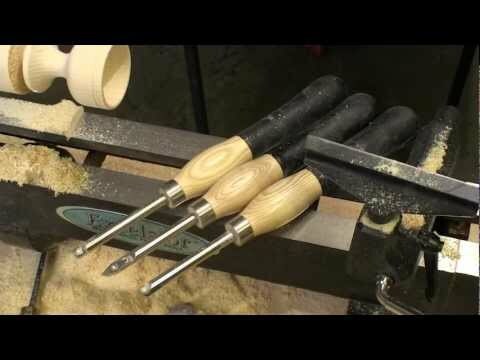 These are absolutely the best tools I have ever used for wood-turning. The only thing I could say about them is I wish the handles were a little longer. But other then that, they are great tools. Great little tool for small projects. Great set of cutting tools. Stay sharp. Like the rubber grip handles feel great to hold. Very sharp and easy to use. The flat bottom helps keep the tool stable and straight. This is soft maple turned with the mini carbide tools. Very happy and thankful I purchased them. 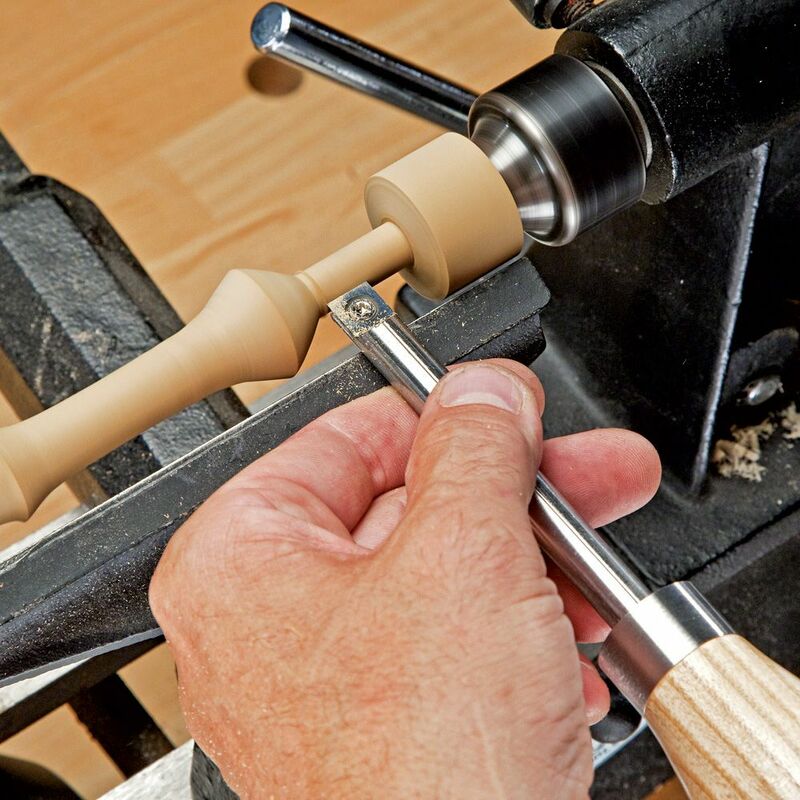 Great for turning on a mini-lathe. They cut quickly and cleanly. Very happy with these tools, they are nicely made and just what I needed. Would certainly recomend. These are great! I have been around a while and have long understood the value of carbide edges. The handles top these tools off nicely! These chisels are already being encouraged to several friends, ready to purchase. It's so nice not to worry about sharping these and they feel great. They are balanced. The title says it all -- NO SHARPENING NEEDED! If you're like me, you like to do the work but not the maintenance. I've turned a bunch of pieces with these tools - Anything from intricate christmas ornaments to a full size baseball bat. They performed perfectly. Best I have ever used. But they are the only ones I have ever used. ?? I like the length of them and they work good. I bought this set as a gift to myself just to try them out. A friend who teaches industrial arts swears by them. They cut aggressively and take some practice to learn to use them. The pointed tool is great for delicate detail work. I just finished turning angel ornaments for my family (all spindle work) and they worked very well. 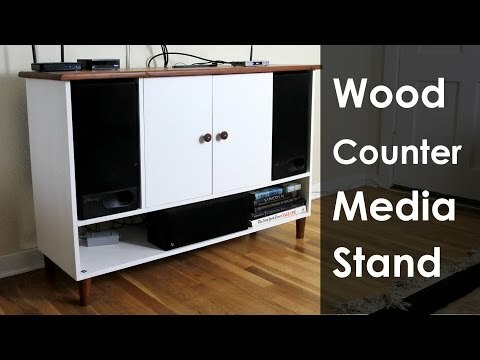 This set was recommended by a fellow woodworker. I currently own and extensively use the full size versions of these tools. I wouldn't even consider another brand for the smaller set,! All of the specifics that I was looking for. on sale, great price! great reviews! first set of turning tools for me. I like the carbide tips that can be replaced. Good sale price. 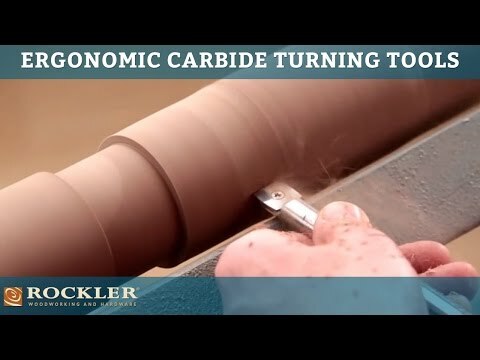 Want to up try carbide turning. Good value entry. 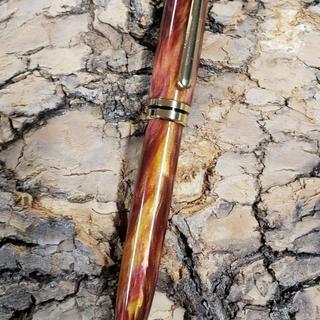 turning pens and other fine work. Like the carbide tips--less sharpening. I want to add to the collection of carbide tools in order to cut down on sharpening time. I have just one now and it works great. Was a requested birthday gift. Great beginner set that does not require a sharpening system. Will work great for small pieces. Never used these before. Wanted to try it. Watched the videos and it looked easy. In-store sales rep recommended it. Also, presently at a great sale price. Price and don't want to buy sharpening tools. I've always wanted a carbide turning tool set hopefully these will suit my needs. Quality set at a good price! Try something new for turning small items. If I like them, I might buy the full size. Just started turning wood and needed knives to turn wood! I needed quality tools for making quality projects and these were too good of a deal to pass up. I'm excited to start turning with these! 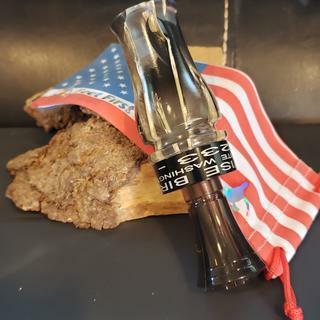 Choose this as an addition to my lathe turning tools so I have the flexibility of the carbides and do not have to worry abut sharpening regular tools. 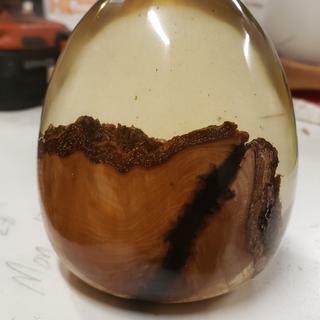 I plan on doing more epoxy / wood projects on the lathe and regular tools won't work as well. my current tools are to large for small pieces. Could not pass up a set of carbide turning tools for only $130.00. Very happy with the mini lathe I just bought from you folks, now I need a great price on turning tools. I have been waiting for them to go on sale, and they did. Love this set. I have one and am sending this to a friend who is new to woodturning. A great starter set. Want the carbide cutters to reduce sharpening while turning. Upgrading from my HSS set because I'm tired of sharpening them a lot when turning hardwoods. 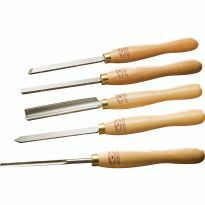 Wanted turning tools that do not need sharpening as often as regular turning tools plus the size will be perfect for the size of items I like to turn. I bought this set and wondered if the 1/2" square radius cutter will fit either the square or round handle? 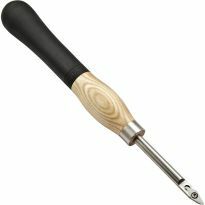 Or do I have to buy another handle for the radius cutter? What is the difference between these and the mini turning 3 piece kit? I have the pen carbide turning set and the difference between the two sets is the shaft size. Also the cutoff in the pen turning kit is the stainless steel whereas the larger set in carbide. BEST ANSWER: Yes you can easily sharpen them. I use a diamond dust sharpening plate. Take blade off tool turn upside down and rub in a circular motion . I'll do about 4 circles on the course then four on the fine. Keeps them nice and sharp. Yes. Remove carbide cutter from holder, turn cutter upside down and rub back side on diamond plate. what are the different tools in the carbide kit used for? 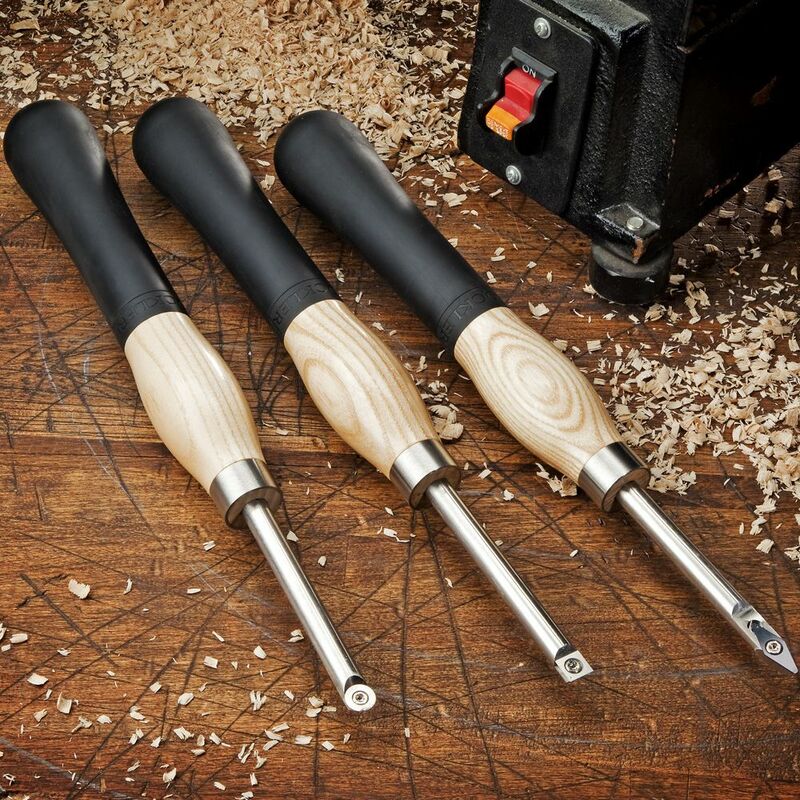 BEST ANSWER: Lathe Chisels for turning. 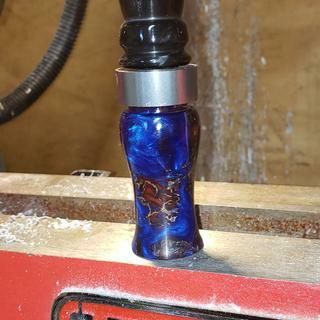 I use the round one for roughing wood, plastics, acrylics such as pen kits as well as making nice rounded cuts in the center or on the turnings instead of a V shape mark. The square one I use to smooth out straight items turning on the lathe makes a very nice smooth finish and straight line. The diamond shaped tool is used to do intricate cuts such as bands or rings or ornate designs on turnings. 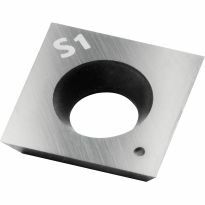 Can you use the SR1 cutter in place of the S1 cutter? Are these the same tips used on the larger tools or are they different ? BEST ANSWER: The tips are smaller than on full sized tools. 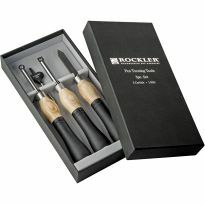 Rockler indicates that the tools are not interchangeable within the different size tools. They will not fit the larger tools. What is the difference between this diamond tip and the parting tool from the pen turning kit? BEST ANSWER: The tools in the mini carbide set are 13.5 inches long. The pen turning tools are more compact - only about 9.5" overall. The actual carbide cutting tips are the same for both. Just a little confused on what is included. 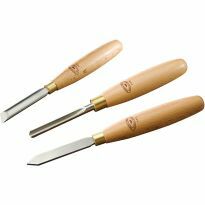 Do I get the blades with the hand tools or do I need to purchase the blades separately? BEST ANSWER: Each tool comes with a blade, at least when bought at the store and I don't think the on-line buy would be different. They are designed to rotate as well, so it should be some time before there's a need to buy replacement blades, if ever. You do get the blades with the tools. And from my perspective they are my use all the time tools, especially the round. Other than a standard parting tool and a couple of bowl scrapers, I depend on these. I bought mine online. The handles do come with blades included. Dull blades can be rotated. When entire blade is too dull to use, replacement blades can be purchased separately. Yes, each tool comes with a cutter blade mounted on tool. 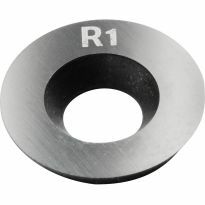 Replacement blades are available from Rockler after using the four surfaces on the included blades. When I bought mine the cutters came with the tools. Hiowever, I bought a square radius cutter to replace the perfectly square cutter that came with them. All of them come with the carbide cutters. But I would replace the cutters with something better.Enter an answer to this question. Yes, the blades come with it. When they wear out, you can purchase new blades. The blades are included. Replacement blades need to be purchased separately. The blades are installed and shipped with each tool in the set. Do the square and round tools work for bowl turning too? BEST ANSWER: round is better for finishing, square works great for roughing. I love these tools. works great for small bowls. Deeper bowls will probably need the larger carbide tools. The round for small bowls on the interior and the square for the exterior work well. They are shorter, so the longer tools would be better for larger bowls. Round is better for me. Square takes off to much material. Round gives a better finish. what lenght is the tool? I dropped a screw and it's disappeared. What size do I need? Thanks! BEST ANSWER: Sorry Dave, I have the same turning set but no way to measure the size of the tiny screws. My suggestion: remove a screw from one of the other chisels in the set and take it to your local big-box hardware or home center. Most of them have a card that can immediately measure the screw size. 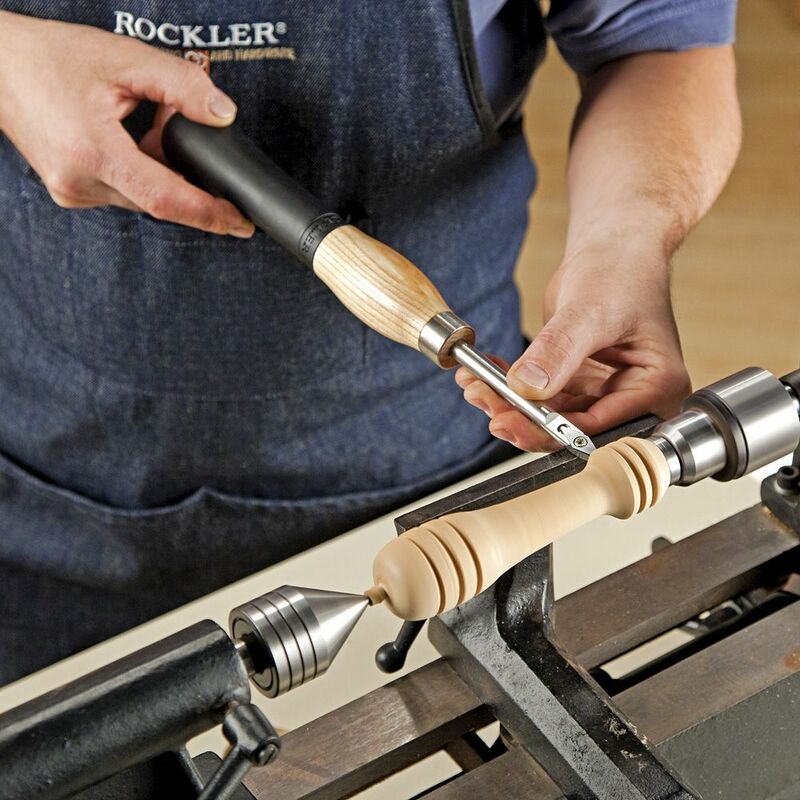 If you cannot find a replacement call customer service at Rockler. They are usually able to help. According to an answer from another user on the actual blade replacement Q&As "M4 - 0.7". What is the shank diameter? BEST ANSWER: The shank diameter is just over 7/16 of an inch. Whats the deepest bowl or cylinder you can turn with these tools? BEST ANSWER: I’ve never turned a bowl. I only use my lathe to make small items like pulls. But these tools work great for this. What is the difference between the square blade and the square radius blade. BEST ANSWER: Square cutter is actually square with sharp corners. Square radius has very minor curve on all four edges, but also sharp corners. The radius blade is a little more forgiving if you happen to catch a corner when movinig the tool sideways along a workpiece. What size are the tips for replacement? 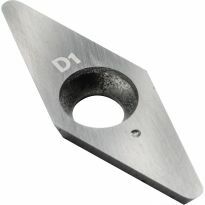 Has anyone found replacement blades from other places other than Rockler? Is there an SR1 for the Mini set?